Thanks to awesome school trips, I’ve now been to both Oxford and Cambridge, England’s two most prestigious universities. Both were really cool and I have no idea which one I’d rather go to if given the chance. Thankfully, I’ll never have to make that choice: Oxford and Cambridge are extremely selective and mostly take kids from England’s private schools. Both schools also require interviews as part of the application process and these interviews can be, from what I’ve heard, extremely terrifying and rigorous. Both these universities are made up of different colleges with different specialities and you apply to these places directly. Oxford has 38 colleges and Cambridge has 31. Both Oxford and Cambridge have that college town feel, though Oxford is a bit more rural than Cambridge. In Oxford, there’s beautiful fields all around the town, some with cows in them and a river runs through the center of the town as well. The other cool thing about Oxford is that they filmed a few scenes from Harry Potter here. The Hogwarts infirmary building is here and so is the staircase from the first movie (where the first years congregate before entering the hall to be sorted and Neville finds his toad). 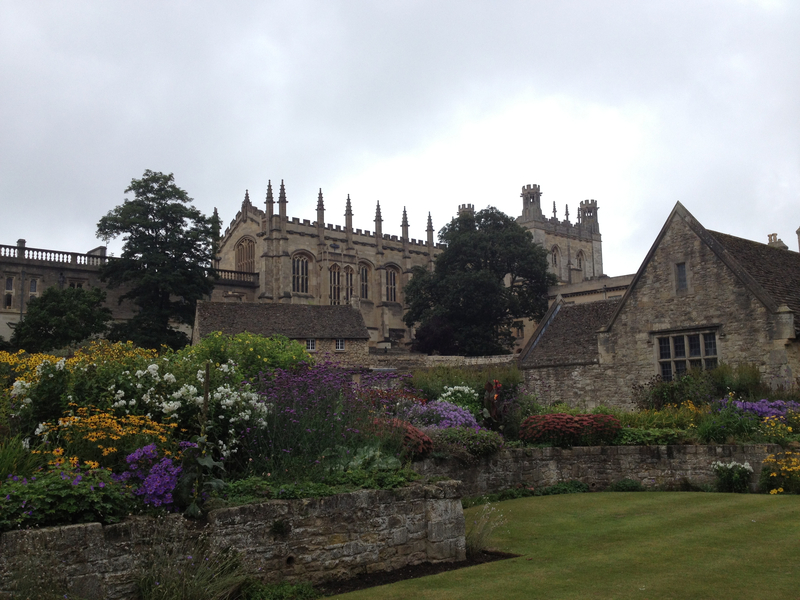 Once we got to Oxford, we got a short walking tour around the city before getting a chance to explore on our own. After buying some Oxford sweatshirts (sorry ‘Cuse! ), we walked around the city a little before deciding to have a late tea. It was delicious and a great way to end the day. 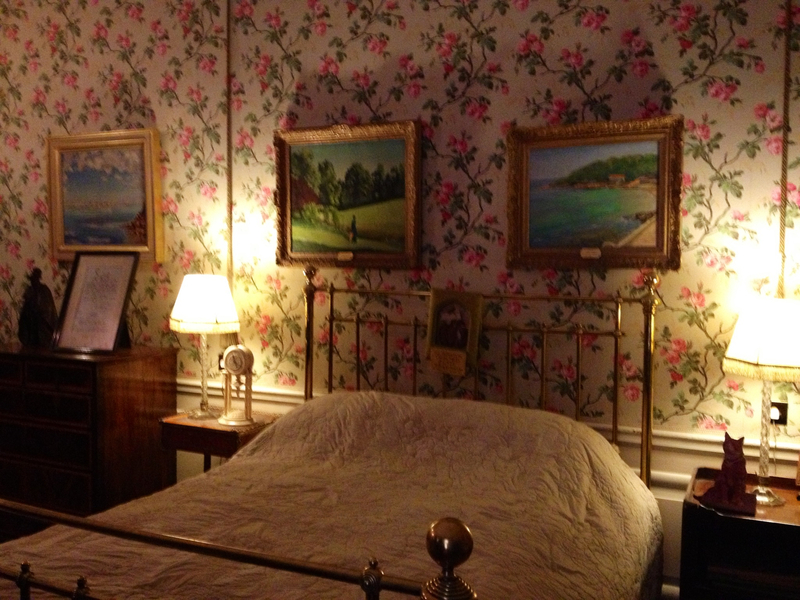 The bed where Churchill was born inside Blenheim Castle. But I should mention that before we even got to Oxford, we made a quick stop to visit Blenheim Palace, located about 45 minutes outside Oxford. Blenheim Palace is owned by Winston Churchill’s family and Winston Churchill was born there, proposed to his wife there, and is buried there. It’s very ornate and beautiful and Churchill’s descendants still live there for part of the year but because of the expenses associated with maintaining these ancient castles, they open it to the public for the tourist season to earn additional revenue. The following week, we traveled to Cambridge, which is both farther away and younger than Oxford. By the time we got there, we were all starving so our first stop was a pub for lunch. 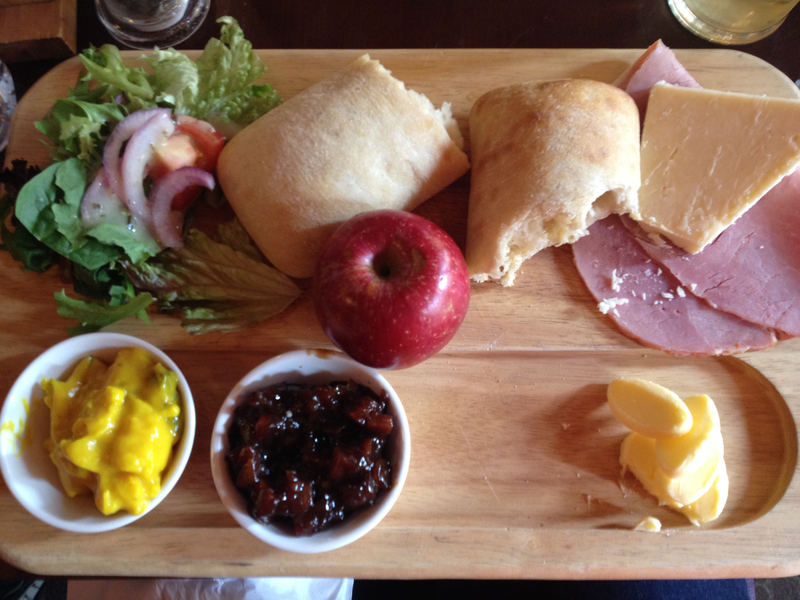 I had this great lunch tray type item with cheese, ham, an apple, two kinds of pickles and some warm, fresh bread. It was delicious and, while I don’t usually photograph my food, it was certainly photo-worthy. After lunch, we walked around the town, bought Cambridge gear (have to be fair to both sides of the rivalry!) 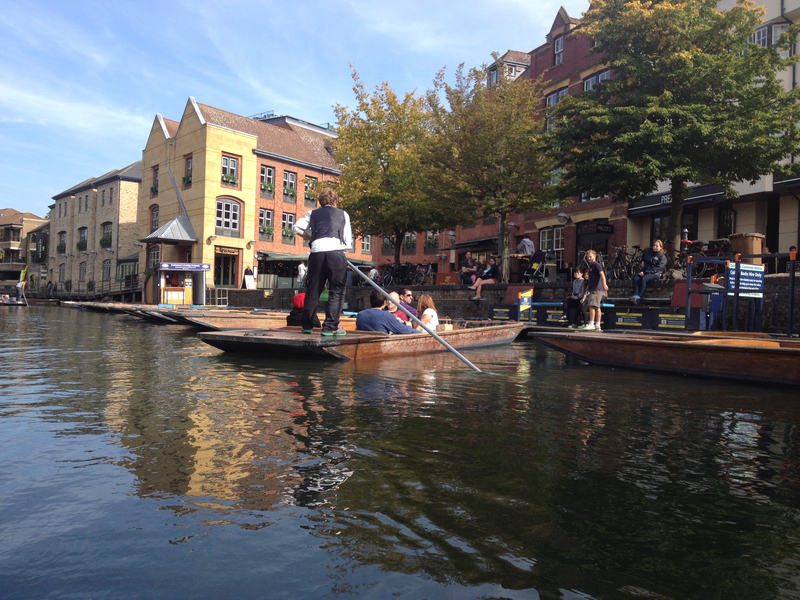 and then decided to go punting on the river. Punting is kind of similar to the gondolas in Venice in that you all sit on a flat boat and a guy pushes you around using a long pole. It was a gorgeous day and it was a lot of fun to see Cambridge from the river. They were actually filming a movie about Stephen Hawking (who attended Cambridge) while we were there and we saw quite a few cameras and movie vans around. But all in all, Oxford and Cambridge were both great trips that let me pretend, if only for a day, that I actually go to school here. I’ll have more posts about my trip to Brighton and other things I’m up to later this week. 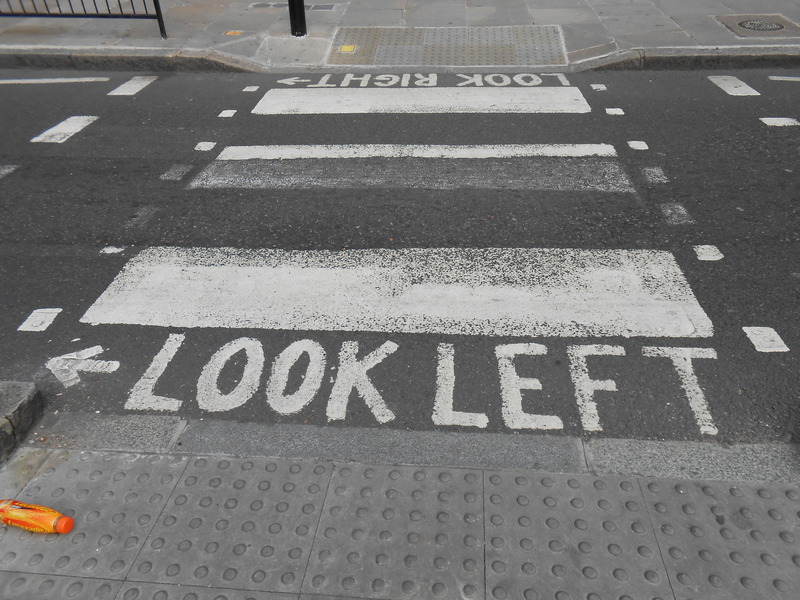 …especially in London! Thanks to my school offering lots of really cheap theater tickets, I saw five shows in eight days this week at three different venues. 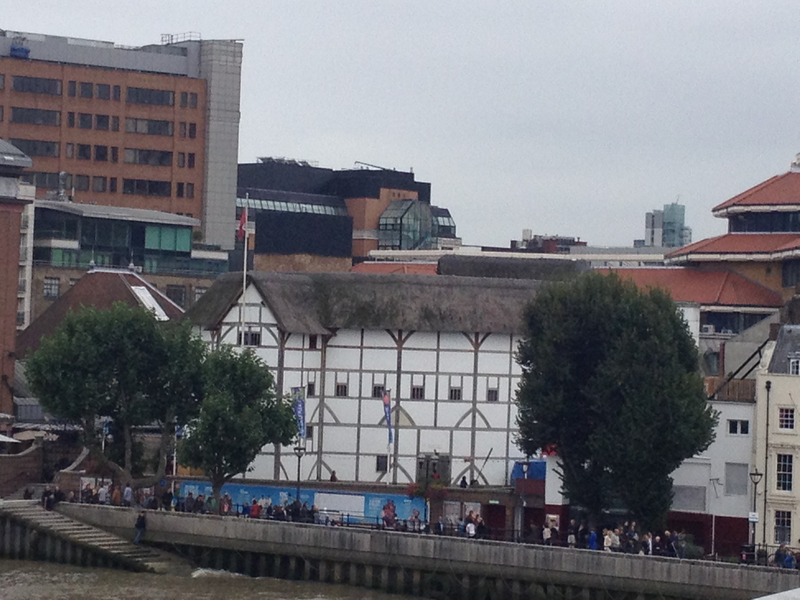 View of the Globe Theater from the Millennium Bridge (white building). 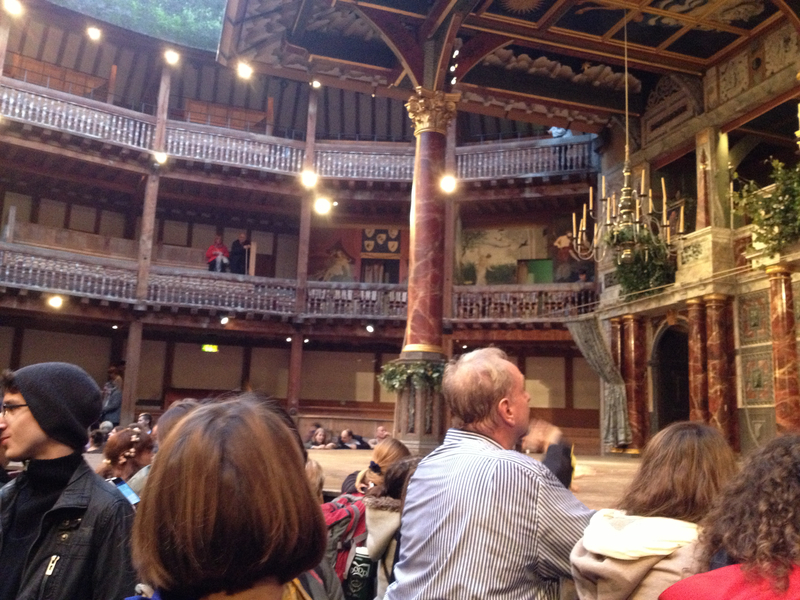 On Thursday, I saw the first of two shows at the Globe theatre: Shakespeare’s “A Midsummer Night’s Dream.” The Globe is a really cool venue that is an approximate copy of what it would have looked like in Shakespeare’s time. And the fact that it exists is really thanks to…Joe McCarthy and HUAC? Yep. The Globe was built by Sam Wanamaker, an American actor who was blacklisted in the 1950s due to his affiliation with the Communist Party. He came to England and made restoring the Globe his life’s work. Like in Shakespeare’s day, most of the seating in the Globe is standing and the theater top is open so if it’s raining, you better bring a jacket! Standing ticket cost only 5 pounds, which is a real bargain considering the quality of the shows they put on. People wait for “A Midsummer Night’s Dream” to start at The Globe. I had never seen or read “A Midsummer Night’s Dream” before but I really enjoyed the show. The actors were hilarious and it was a really fun time. Two days later, I saw “Macbeth” at the Globe, which was also a great but different experience. Macbeth is one of my favorite Shakespeare plays and I’ve read it a few times but this was the first time I saw it performed. The actors did a fantastic job here as well and I really enjoyed it. As a bonus, the show featured Billy Boyd (Pippin in Lord of the Rings) as Banquo. He did a great job! 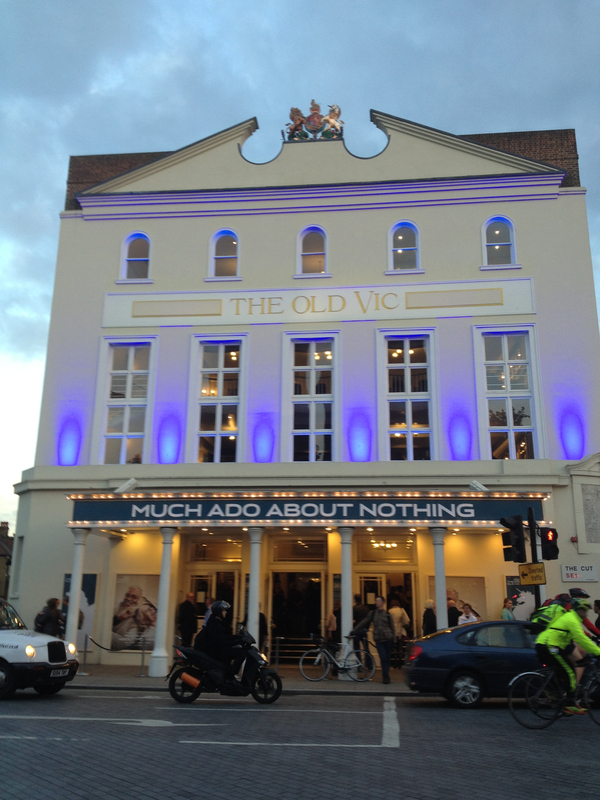 “Much Ado About Nothing” at the Old Vic. So, London’s theatre record was no longer perfect, but it was definitely redeemed with a really outstanding performance of “Othello” at the National Theatre on Wednesday. This version of Othello was an updated version as well but the director pulled it off really well. The set, which consisted of two barracks houses could be moved around in all kinds of different configurations, which was really cool. The cast was also great, particularly the actors who played Othello and Iago. The view from outside The National Theater. The National Theatre itself is a neat place as well. It has multiple levels and multiple theaters inside and a cool complex outside. 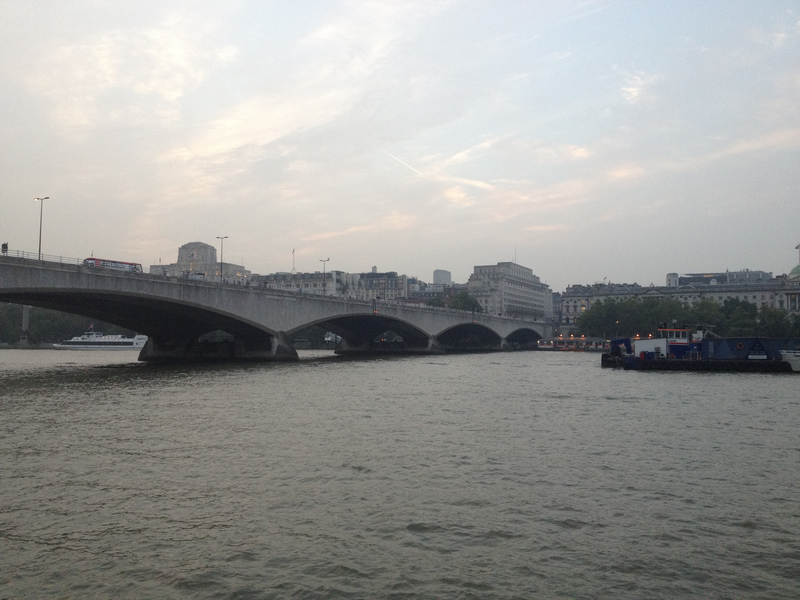 It’s also literally right next to the Thames and it was nice to sit outside and watch the river for a little bit since I got to the theatre early. 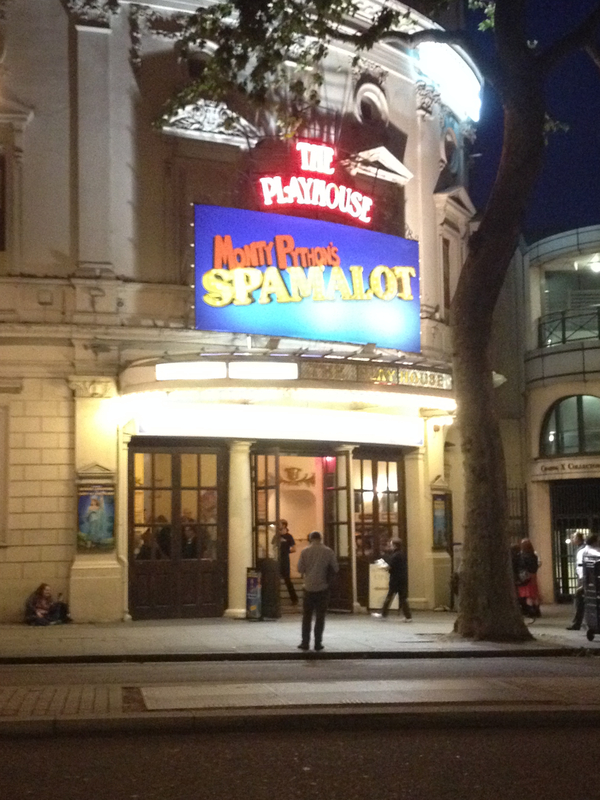 My week at the theatre ended with seeing “Spamalot” at the Playhouse Theatre in the West End. “Spamalot” is a loving rip-off of “Monty Python and the Holy Grail” and is a very silly show. I saw it when it was on Broadway several years ago and this British version was even more over the top than I remembered. But, it was a great way to end a week at the theatre! Spamalot at the Playhouse Theater. Today was spent enjoying the Irish countryside. 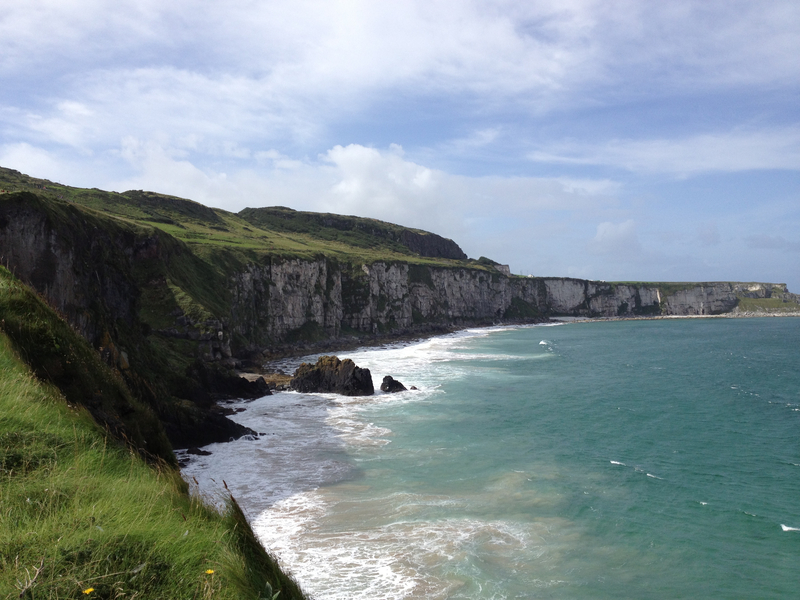 It really is beautiful out here and it looks like the Ireland you see in postcards: rolling green hills, white waves crashing against stony cliffs and more sheep than I have ever seen before in my life. 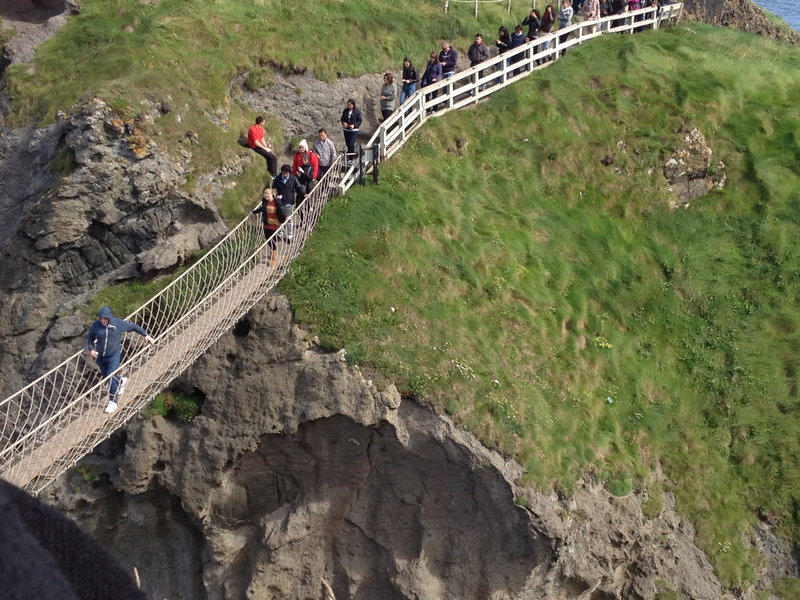 It was about a two-hour ride to get to our first destination: the Carrick-A-Rede rope bridge. Once we got there, it was about a 15-minute walk along the ocean and some terrifyingly high cliffs to get to the bridge. The bridge is actually made of sturdy cable now, not rope and runs a short distance between the main cliffs and a small island outcropping. It was not as long or as scary as I thought it would be (though many members of our group would probably beg to differ on that point). It was quite windy the whole time and we all had to put on extra layers. We had lunch at the Wee Cottage, where the owner shut down the whole place for us. The cottage was decorated with all kinds of knick-knacks and the walls were covered in different types of currency from all over the world. Lunch was homemade soup, sandwiches, Irish soda bread, tea and coffee, and, to top it all off, decadent scones topped with heaps of whipped cream and berries. We were all stuffed. 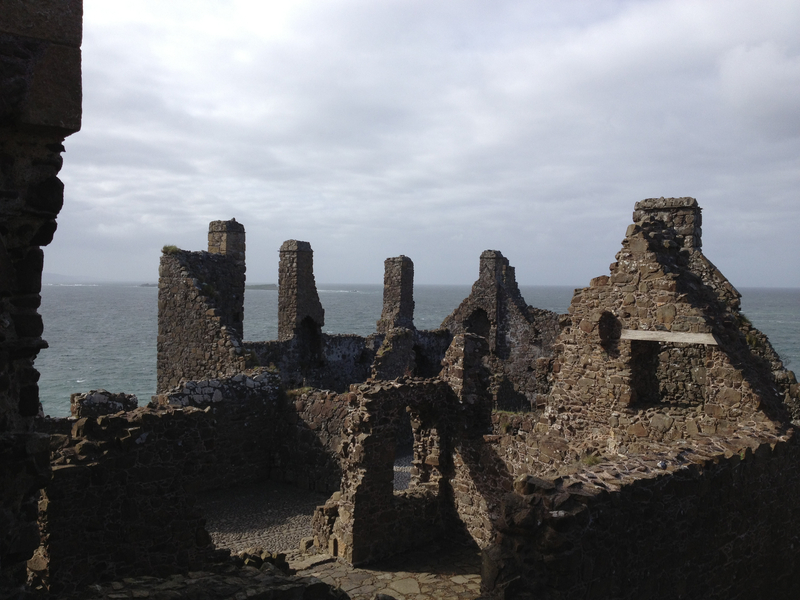 From there, we walked down the hill to visit the ruins of Dunluce Castle. The castle was inhabited by various Irish and Scottish families over the centuries. It was eventually abandoned because it was too close to the edge, too drafty and had become out-dated. Although much of the original castle walls had collapsed or crumbled it was easy to picture how grand it must have been in its prime. Our last planned stop for the day was the Giant’s Causeway, an area filled with stacks of these peculiar, flat six-sided rocks. 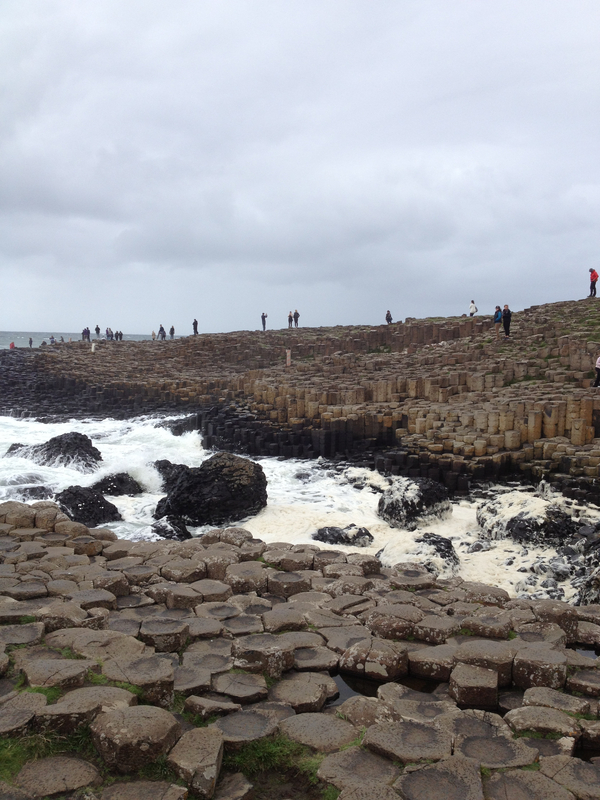 The causeway was created either by giants or by volcanoes, depending on how strong your imagination is. It was about a 25-minute walk to get down to the main area of the causeway and once there, we joined the other tourists in clamoring about on the rocks and getting slightly wet from the spray of the sea. There were also some paths leading up to the cliffs that a few members of our group walked up. On the bus ride back, we made one last quick stop: at a bunch of trees where they filmed part of the Game of Thrones TV show. 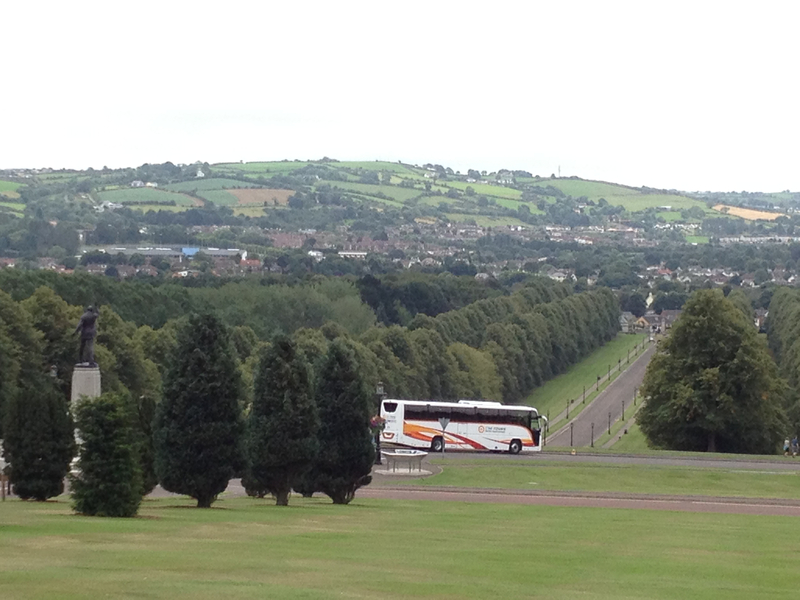 Those who watched the show had a chance to get out of the bus and take a quick picture before we continued on our way back to Belfast. Today, it became abundantly clear how divided this small country still is. As a bit of background, the island of Ireland was split after the southern 26 counties gained independence from England in 1921. The northern six counties are still part of Great Britain. 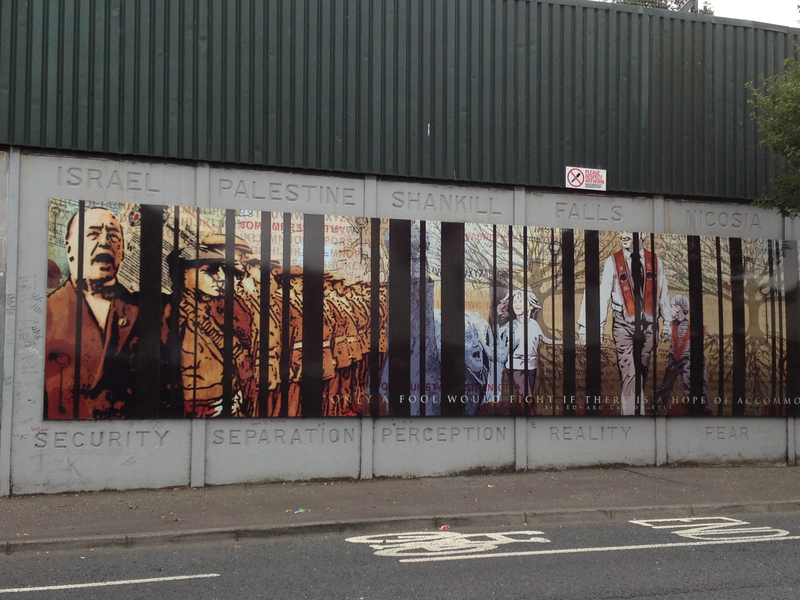 One of the peace walls that separates Protestant and Catholic neighborhoods in Belfast. 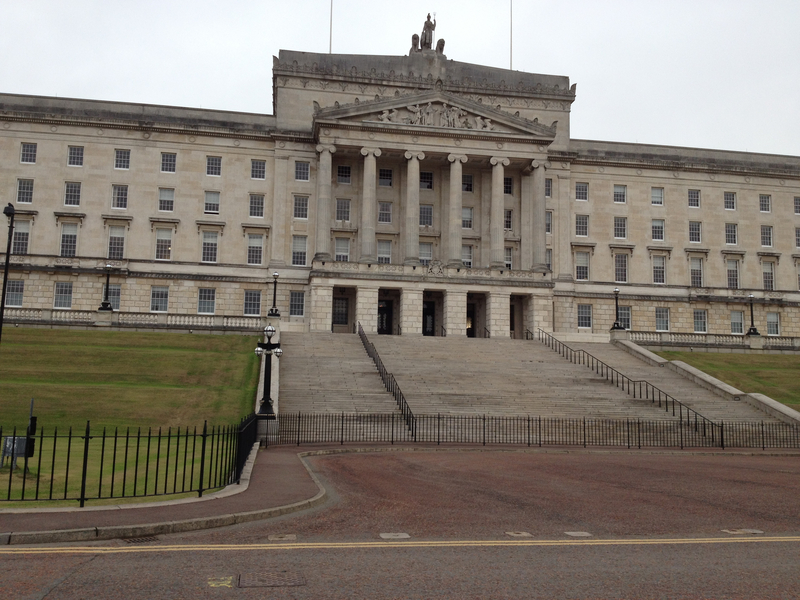 But obviously, not everyone in Northern Ireland agrees with result of the split and we spent most of the day learning about the deep divisions and painful history between the Nationalist Catholic population and the Unionist Protestant population. Probably the most important thing I learned about this conflict is that for the most part, all this conflict isn’t about religion. For many outsiders, including myself, it’s easy to look at the conflict in purely religious terms and wonder why the two sides could disagree on so much when their religions are so similar. But it’s really not about that. Pretty much all Catholics are nationalists (want to unite with the Republic of Ireland) and pretty much all Protestants are unionists (want to stay united with Great Britain), so identifying yourself as a Catholic or Protestant is as much a political statement as a religious one. 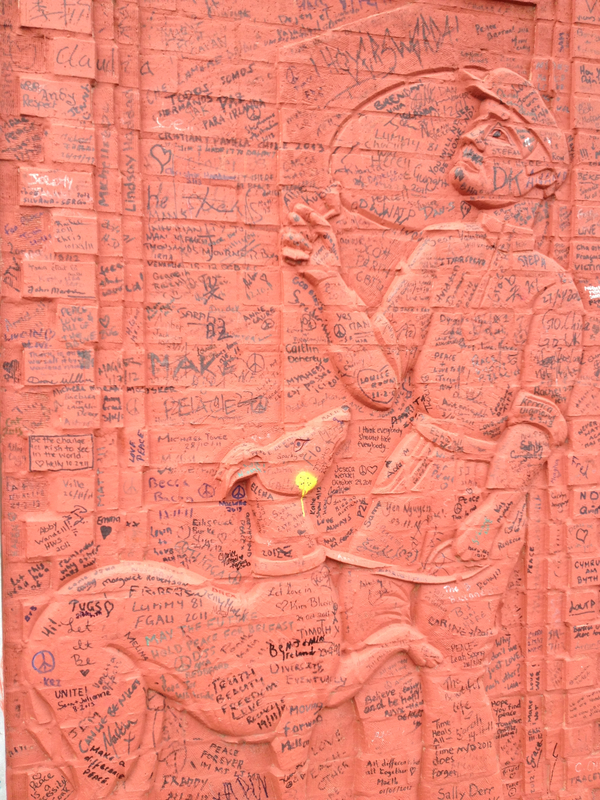 Signatures from all over the world cover the peace walls. Almost all the working class men over about 40 or 50 years old that we met had participated in “the Troubles” in one way or another. The peace treaty between the the Protestant and Catholic paramilitary groups was only signed in 1998, just about 15 years ago, so a lot people still remember the violence and are struggling to move on. Many of the people who spoke with us had served significant time as political prisoners, some joining paramilitary groups as young as 15. 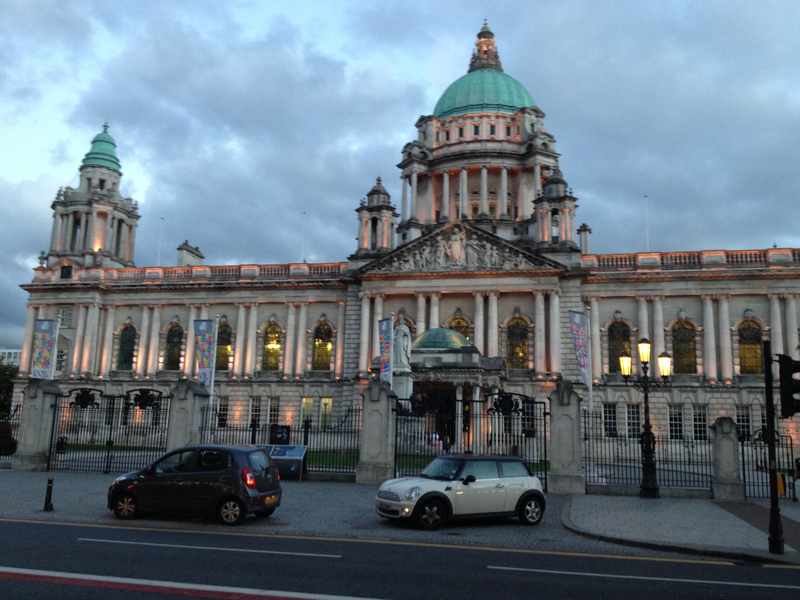 After a brief introduction to the conflict, we split into groups to take walking tours of some of the surrounding Protestant and Catholic neighborhoods. 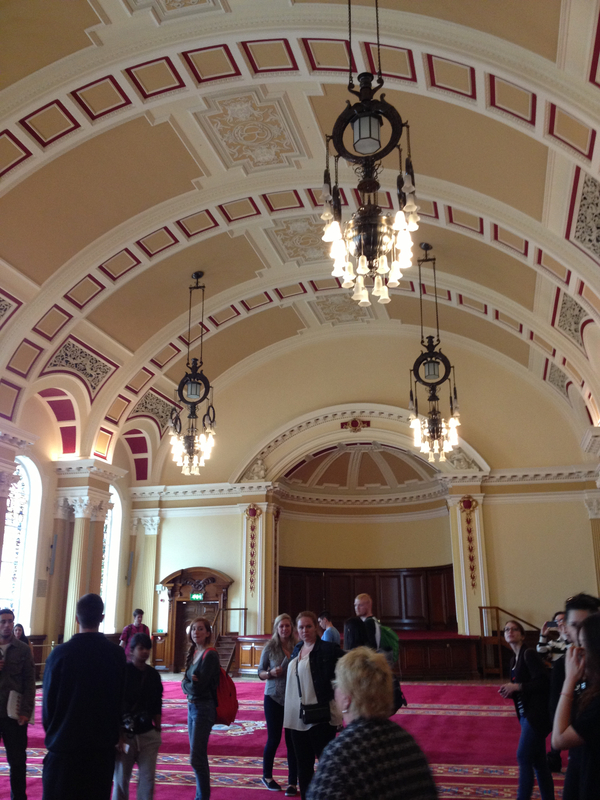 My group walked through the Shankill Road area, a protestant area, first. 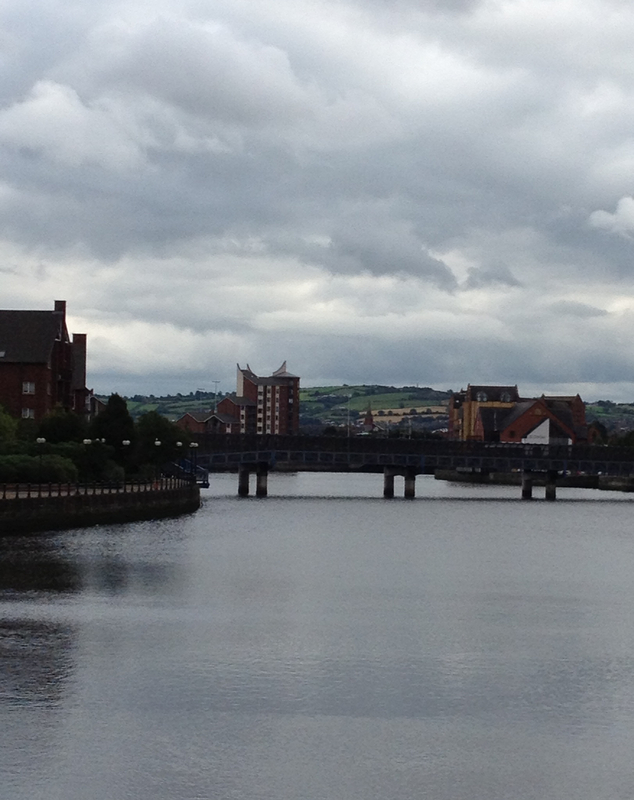 The Protestant and Catholic areas of Belfast are kept apart by a long high cement wall. 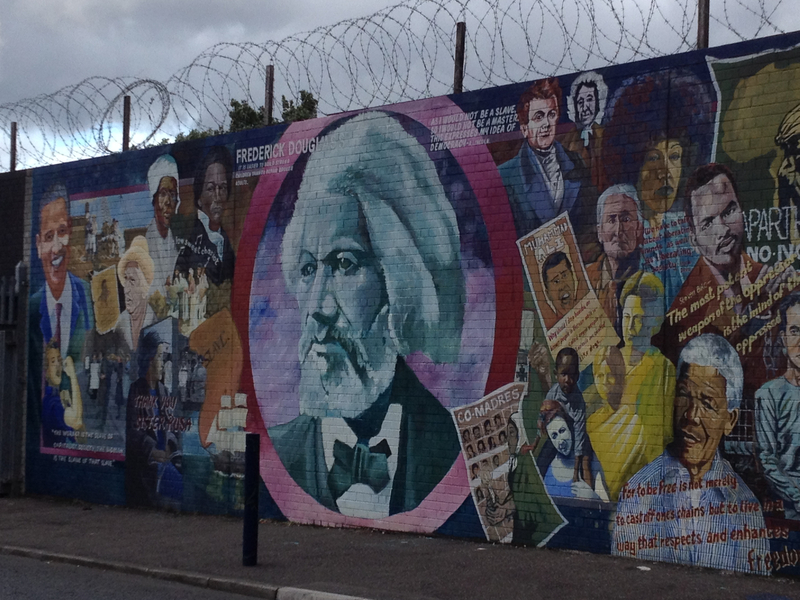 There are a lot of murals and public art in the Shankill road area that both celebrate Irish history and discuss peace. The Shankill area is also filled with Union Jacks, almost every house has a flag outside and there are apparently more flags flying here than is London. 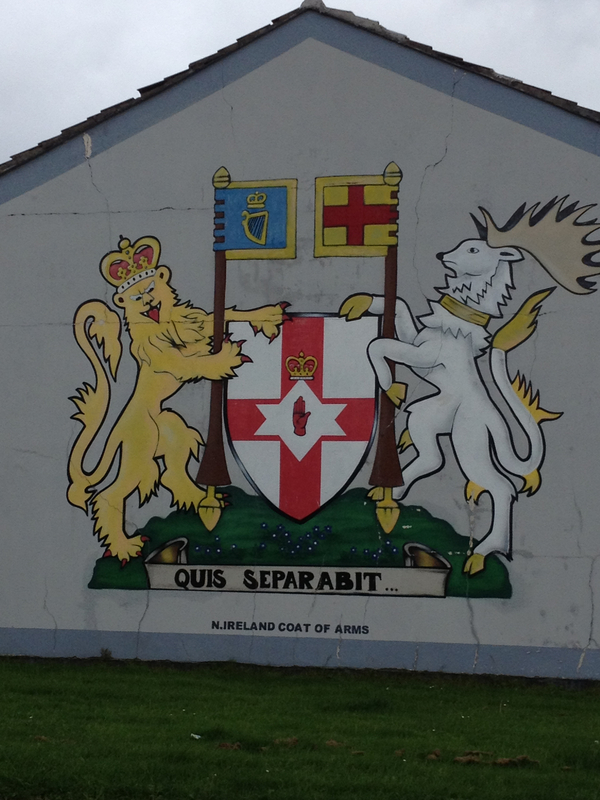 A mural on the Protestant side of the wall. We had lunch and then walked around the Catholic area of Falls Road, which has a lot less public art and almost no murals on the peace wall. You can see that it’s a lot more cohesive than the Protestant area though, which has to incorporate a lot of different strains of Protestant faith instead of just one Catholic faith. We also walked through an IRA memorial garden and visited a giant mural of Bobbi Sands. The last part of the day was a discussion between two Unionists and a Nationalist. I thought they would disagree on a lot more issues but they were in agreement on many of the questions they were asked. Although both sides concede that the peace walls are still necessary, the threat of violence here is much less than it was in the past. Generations are aging and many kids now will grow up without ever experiencing the violence. 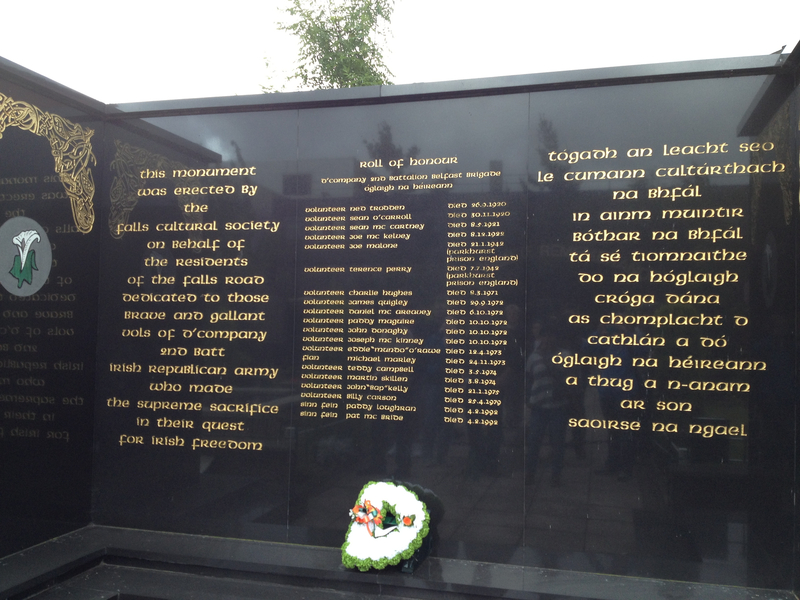 An IRA memorial on the Catholic side of the wall. The country still faces many challenges though including education, healthcare, equal rights, and assimilating political prisoners back into society. But the greatest challenge may simply be returning to a normal state of community relations. It is still almost unheard of for a Catholic to walk into a Protestant area and vice versa. But, at least from the people we talked to, there seems to be a general desire to get along. And both sides have come a long way. Just 20 years ago, both groups were killing each other on sight. Now, they have settled into an uneasy peace, which will hopefully endure for many years. A mural pays tribute to the American civil rights movement. 1. Yes, they drive on the wrong side of the road. 2. They really love queues (lines) and will give you dirty looks if you try to violate the sanctity of the queue. They even queue at bus stops. 3. 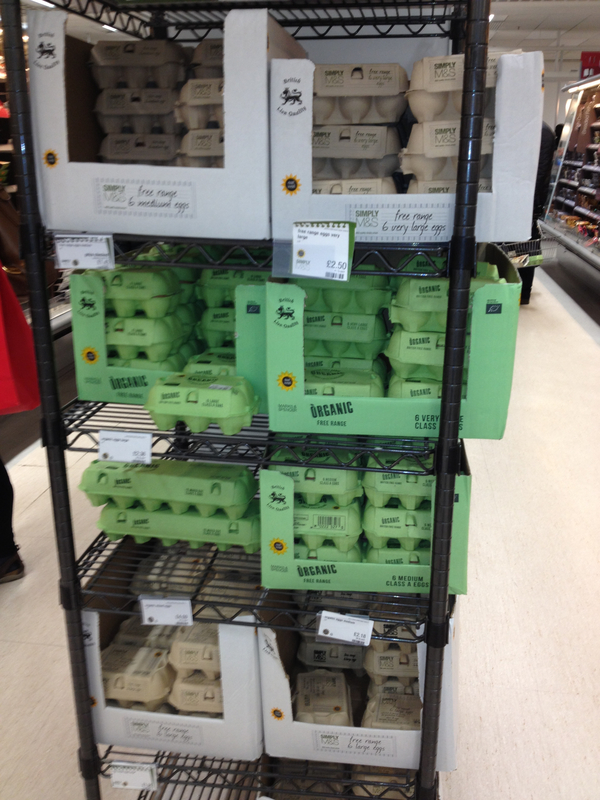 They don’t refrigerate their eggs. 4. The outlets. 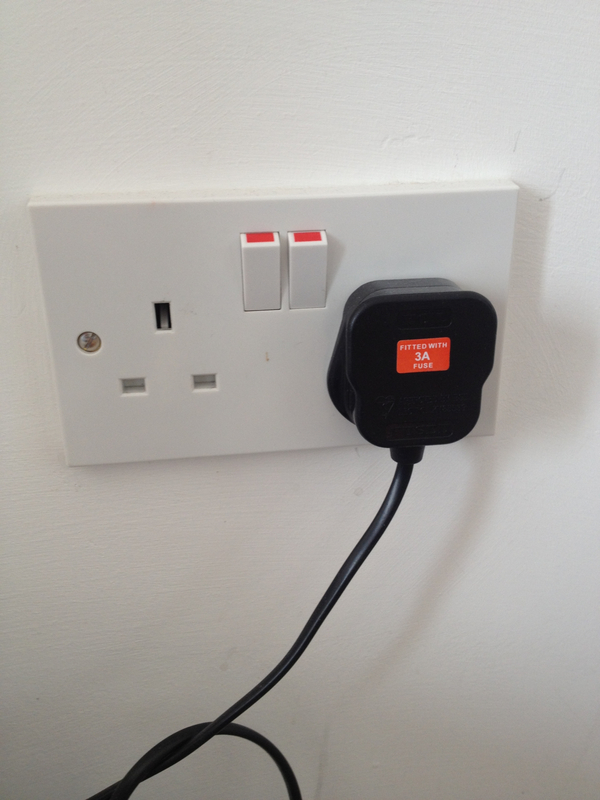 You have to turn them on before they work. 5. The money. 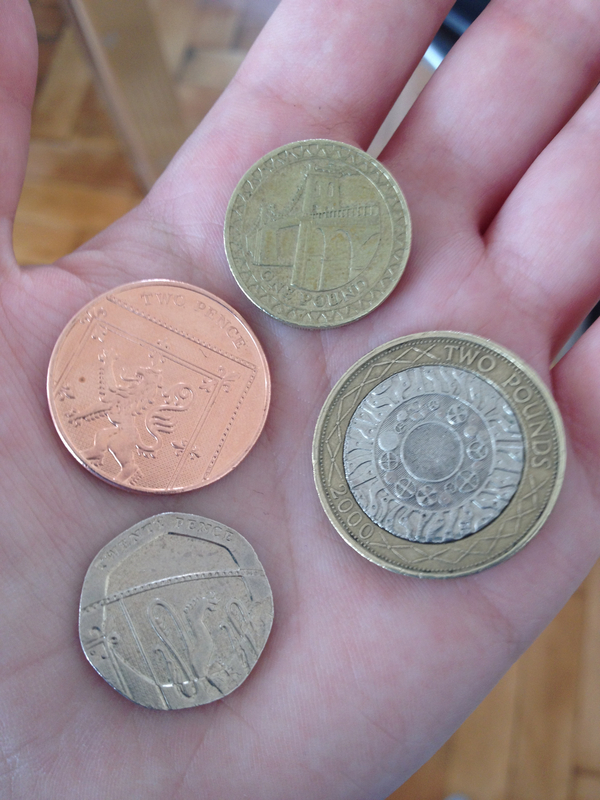 They have one pound coins, two pound coins, two pence coins, twenty pence coins and fifty pence coins here. The smallest denominator bill is a five. 6. Dates and time. They use a lot of military time here. And the dates are written day-month-year, not month-day-year.